Our friends Alex & Florence are a traveling couple from the UK currently roadtrippin’ from Tasmania – Darwin – Perth! Both graduates with backgrounds in Graphic Design & Education, they decided it wasn’t time for the standard 9-5 & packed up to travel our beautiful world documenting their travels on their inspiring Instagram @planet_pixels! We were lucky to catch up with them this week to find out more about their life & passion for travels! Alex describing Flo: Organised, kind & lights up a room with her smile. Flo describing Alex: Laid back, so much so he’s almost horizontal, Passionate & hard working. YoHome:What is the feeling of ‘home’ for you? YoHome: What made you two decide to pack up & road trip across Aus? Alex & Flo: We decided to leave the UK for Aus after graduating in 2015. We weren’t ready to settle down and have a 9-5 job. We wanted adventure! YoHome: What does a typical day for you two look like? Alex & Flo: We sleep in our trusty station wagon that has a double bed in the back. After having a peanut butter sandwich (everyday). We make a coffee on our cooker which is often in gale force winds and drink it luke warm! The things you don’t see on Instagram! We then hit the road in search of beautiful destinations and collaborate with brands whenever possible along the way! YoHome: What are you top 5 must haves when living/travelling in a mobile home? Alex & Flo: Our tech & lots of in car chargers, Flo’s beauty salon corner, Alex’s herbs and spices for cooking, A clean and comfortable car, awesome music. 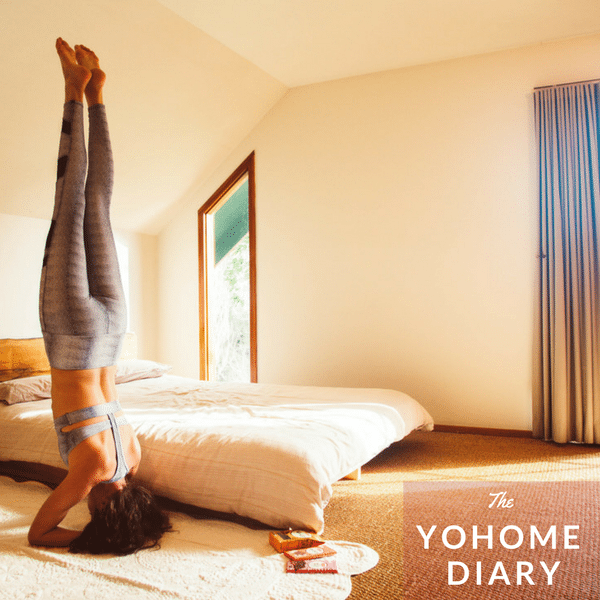 YoHome: Is it easy to continue to practice Yoga while on the road? Alex & Flo: Flo likes to do short bursts of yoga, which is easily done as we feel like we have all the time in the world! We both enjoy Bhramari Breathing it’s a quick way to gain the benefits of yoga even when you don’t have time for a full yoga workout. YoHome: You have travelled all over, where are some of your favourite places? And why? Alex: That’s a tough one, but it would have to be Bicheno in Tasmania. We only spent a couple of days, here but the surfing is great and the road hugs the awesome coastline. Flo: Without a doubt Atherton Tablelands in North Queensland. The waterfalls are second to none. My ultimate favourite was Wallaman Falls! It’s the largest waterfall in Australia! YoHome: Anything planned for your next trip? Alex & Flo: After our road trip from Tasmania to Perth, our plan is to work until our visa expires in Feb 2018. Then we will be heading to New Zealand for another chapter in our travels! Alex & Flo: Travelling for the rest of our lives isn’t unrealistic for some, but ideally we would love to be in successful full time work. Careers that bring us happiness and a life that is relatively stress free. Even if that is dreamy! Regardless of this, travelling will for the foreseeable future always be the focal point for all that we do. For anyone thinking of travelling we seriously recommend it! It teaches you about life and gives you lifelong memories. Whenever you return from a long trip away you always feel like you’ve changed as a person and always for the better. Anyone can travel and experience the world. Get out there and explore! Happy Travels! A massive thank you to Alex & Flo for taking the time to chat to us & giving us a sneak peek into their incredible life & journey! Be sure to check us out on social media & keep an eye out for more interviews like this coming up in the very near future!